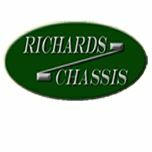 All Richards Chassis are made from 2.5 mm British Steel and come Galvanized as standard. Inc. VAT: £2,296.32 Inc. VAT: Info UK VAT charged at 20%. Ex VAT £1,913.60 Ex VAT Info Outside of EU and EU VAT registered companies only (not UK).